We are a leading Manufacturer of profile sheets from New Delhi, India. 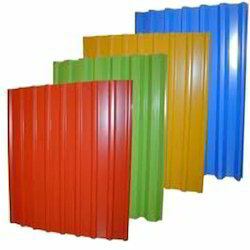 We are one of the reputed organizations in the industry engaged in presenting an extensive range of Corrugated Sheets in the market. These products are made from high grade quality input factors in accordance with the industry set standards at modern infrastructure set up. To deliver the quality approved assortment to our respected clients, these products are tested on numerous quality parameters. Apart from this, our clients can avail these products at economical market rates.